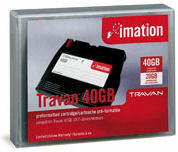 Travan 40GB cartridges offer up to 40GB compressed (20GB uncompressed) capacity while maintaining backward compatibility to the Travan 20GB. Travan technology offers businesses a reliable, cost-effective tape backup and storage solution. With a clear migration path and strong industry commitment, Travan 40GB is the optimal backup solution for the growing data storage needs of your business.